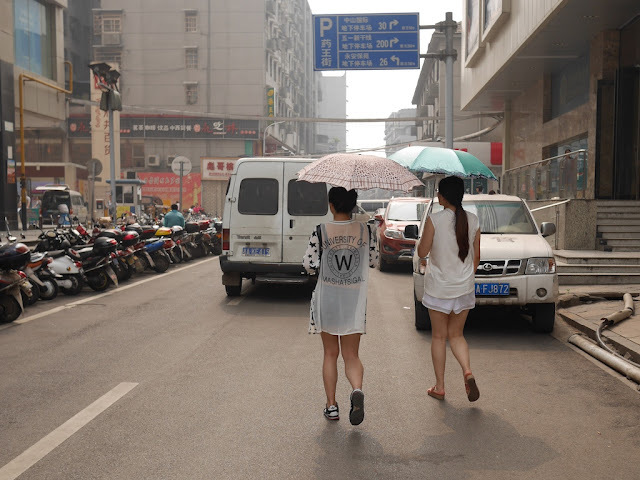 The pollution was still higher than what would be acceptable in the U.S. for long-term exposure, but it felt like fresh air after recent days. 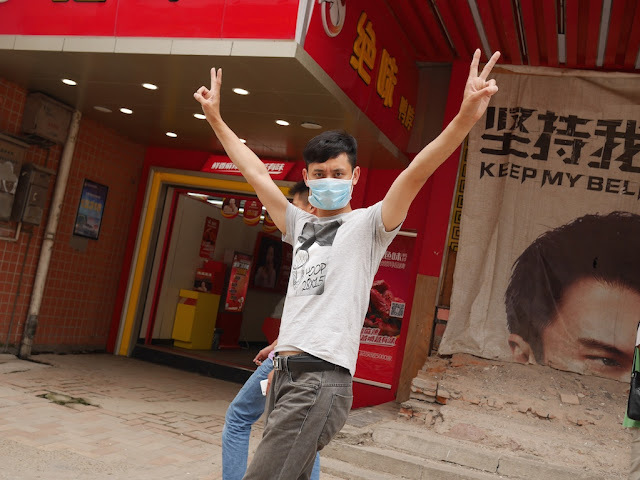 The worst days in Beijing, and sometimes elsewhere, may make for flashier news, but the regularity of days like Tuesday not only in Changsha but many other places as well is a bigger problem for people's health in China. I planned to post something I had expected to be delightfully simple before moving onto more delightfully complex matters. But the post turned into something also delightfully complex and took me down several unexpected paths. Since it clearly won't be finished today, I will now share a photo which tangentially relates to it. As a bonus, it includes a message which may inspire some people. 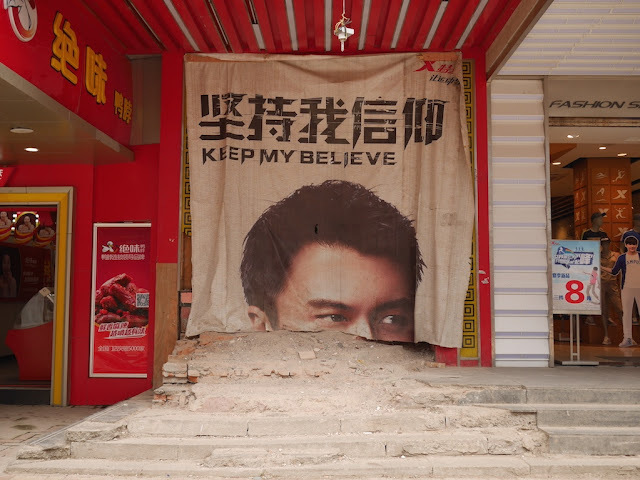 The space under renovation along Changsha's South Huangxing Commercial Pedestrian Street was covered by the upper portion of marketing material for the Chinese sportswear company Xtep. Since I don't know what appeared below the cut, I will refrain from commenting on its possible intended message. You are welcome to seek a deeper meaning in the scene though. For an extra bonus, while I stood there with my camera out, a person walked by and enthusiastically posed for a photograph. I accepted his gracious offer. And now I feel inspired to continue work on the other post. 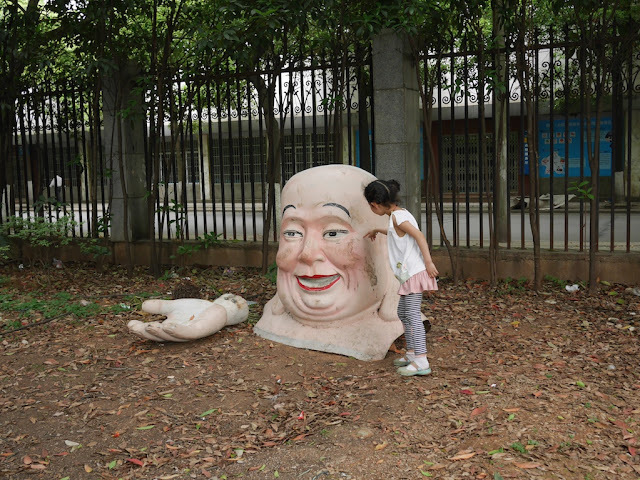 Similar to what I found earlier this year in Chongqing, one thing that remains mostly the same in Changsha since previous visits is the air pollution. 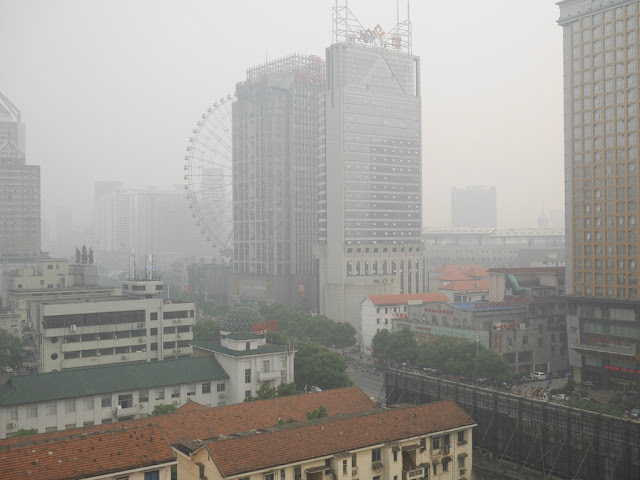 Today was no exception, and Changsha had some of its most polluted air for recent days. According to U.S. standards, the air quality in terms of a 24 hour exposure to the smallest particles was in the "very unhealthy" category. 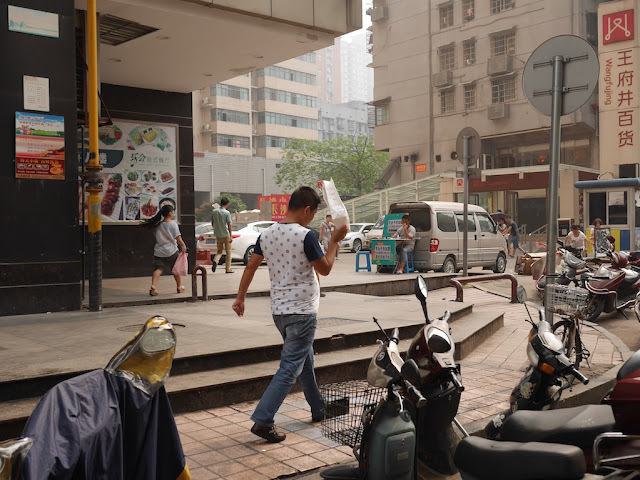 I saw few people wearing face masks, and those I did see were clearly not the types effective at filtering harmful pollutants. Despite the smog, the sun at times did its best on a rainless and humid day to reach humanity. 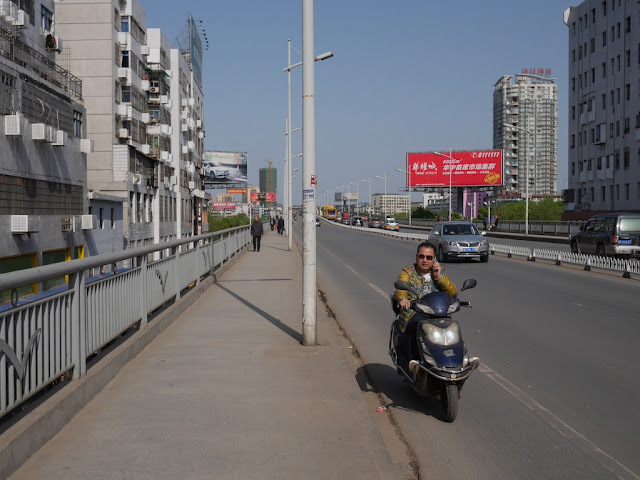 So far more than people wearing face masks, I saw people employing commonly used methods in China to avoid tanning. Perhaps if these people knew the degree to which heavy smog blocks the radiation that causes tanning, they wouldn't have felt the need to take any extra precautions today. Some people talk on a mobile phone while on a motorbike. Some people sleep on a motorbike. 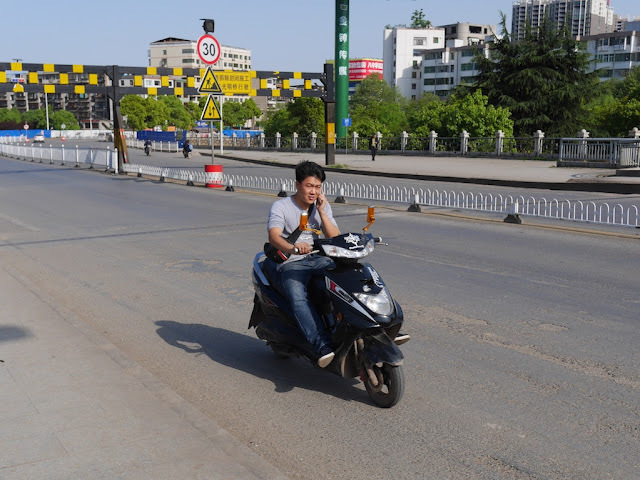 Today in Changsha, some people ate while on a motorbike. And in the background, you can spot something related to a couple of themes for some upcoming posts. 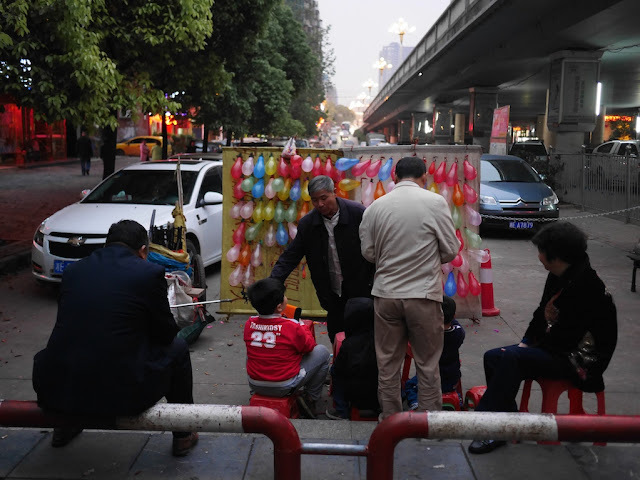 Earlier today while reviewing photos I took in October 2012, I noticed one scene at a riverside pedestrian area in Changsha captured a familiar theme — the deliberate destruction of innocent balloons. 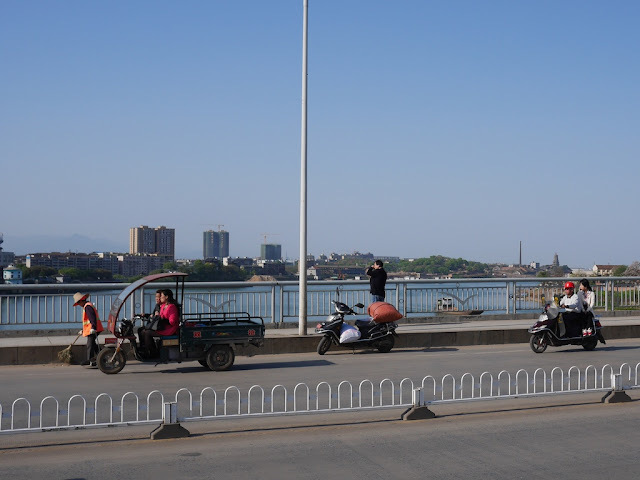 I didn't know when I took the photo that later I would see the same activity in Hengyang and in Shaoyang. 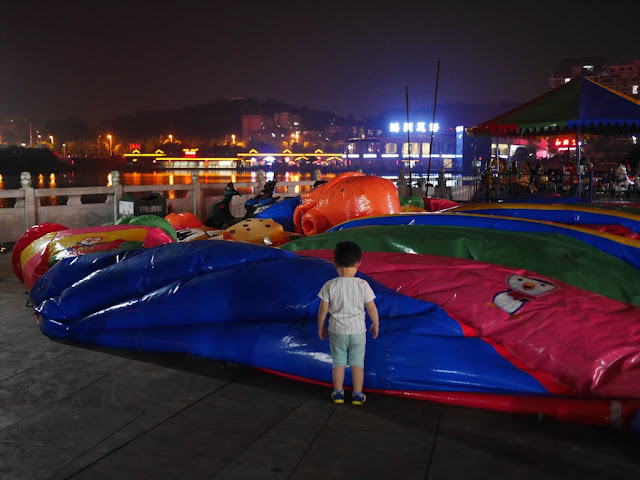 Hunan is a tough place to be a balloon. 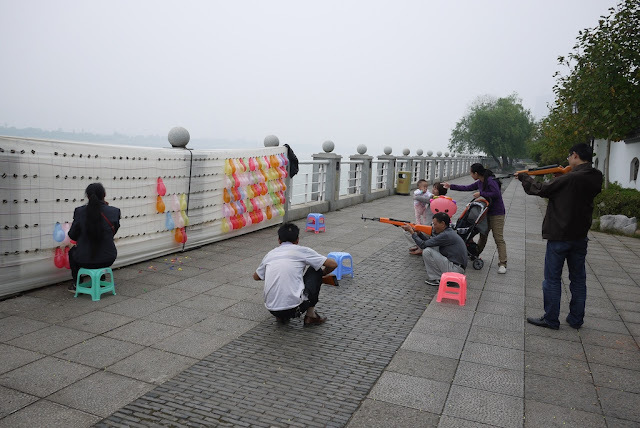 A common evening sight along the river in Hengyang is people shooting balloons. 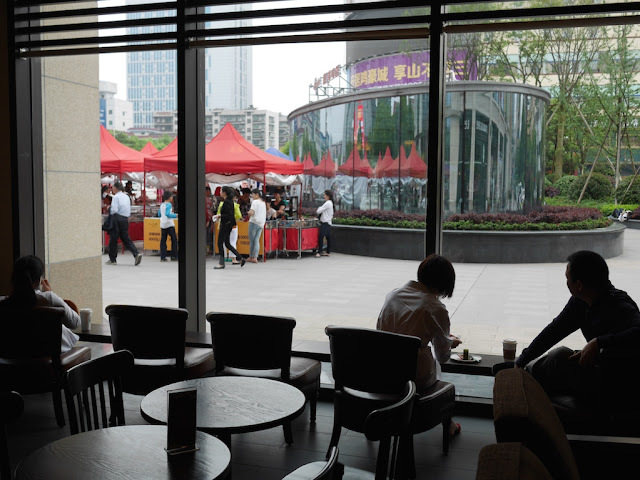 In neighboring Shaoyang I didn't see as much of the activity, including at a popular pedestrian riverside area somewhat similar to the one in Hengyang. Possibly I was just not at the right place at the right time. I did see the activity on at least one evening though. This time a boy enjoyed the opportunity to obliterate threatening colored balloons. In true balloon-shooting spirit, the boy showed no mercy. 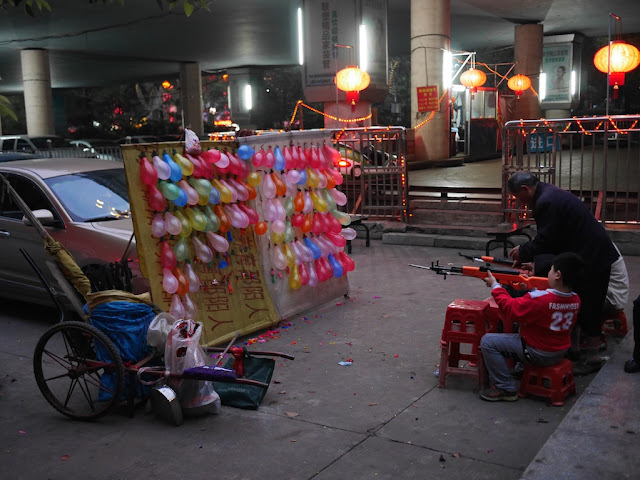 He noticed me watching, so, similar to the four boys with toy guns I met in Maoming last year, perhaps I was lucky to walk away unscathed. 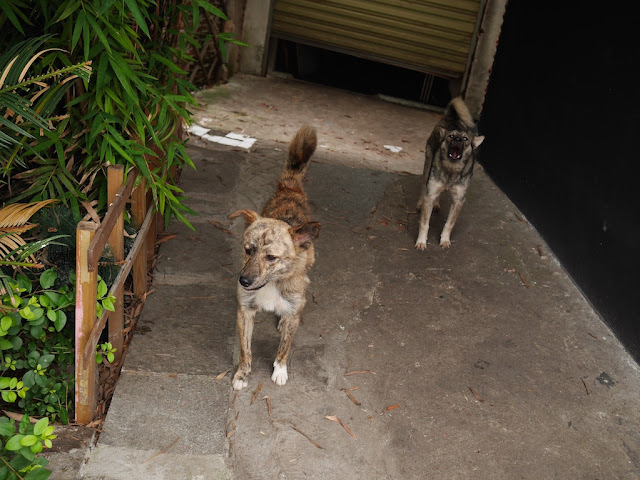 Today while walking down Renmin Road in Changsha, I encountered two dogs who had plenty to say to me. Perhaps the closer dog had realized at this moment I knew they were mostly just bark. 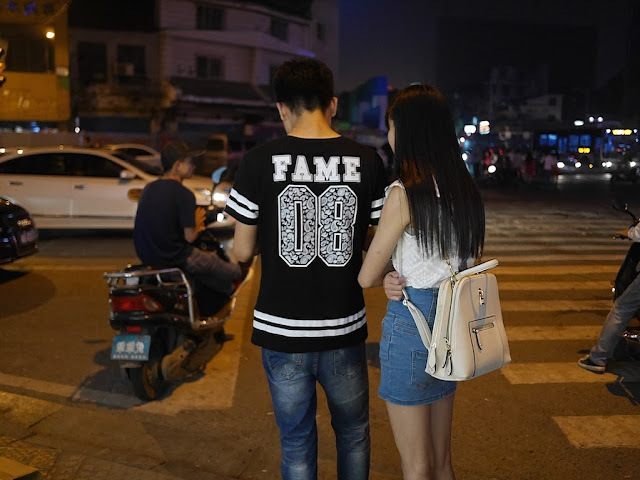 But at least they were standing next to an interesting location — a Chinese barbecue shop. It opens at 5:00 p.m. and closes around midnight. 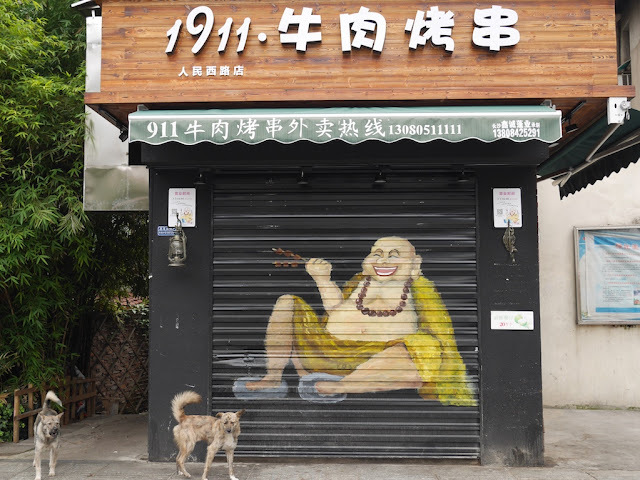 When closed it displays a painting of what appears to be Buddha holding grilled skewered beef. Or maybe it is tofu. Whatever the case, the shop's name specifically mentions beef. 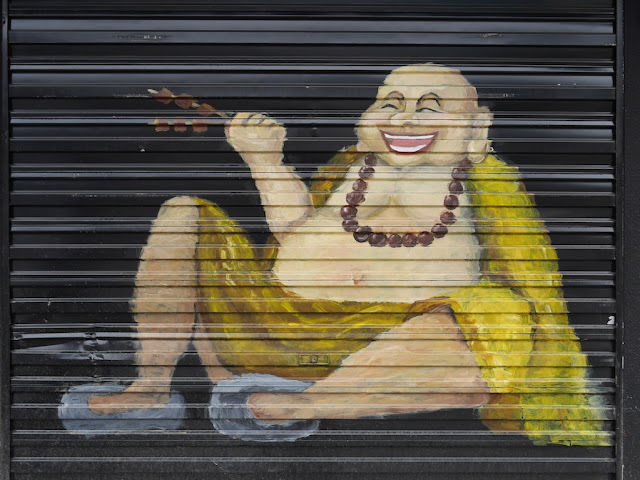 As I took photos of the shop and the Buddha painting, something unexpected occurred. A shirtless man approached me and began screaming at . . . I'm not sure who, maybe the dogs, though they weren't doing anything at the time. He was possibly using the local dialect. I sensed something wasn't quite right as it certainly wasn't normal behavior. Especially compared to what I had seen and dealt with during my earlier 10 years of life in Baltimore, I wasn't worried, but I remained alert. I commented to the man about the painting. His yelling continued unabated. I then decided to start video recording to capture the moment to see if a local friend could understand the man. But he had stopped yelling by then and started to walk away. I sensed all was not over. As the following video shows, I was not wrong, but what occurred was even more unexpected — especially the dramatic "unsheathing". After the man walked away, one person watching nearby used hand gestures to communicate he thought the man was "crazy". 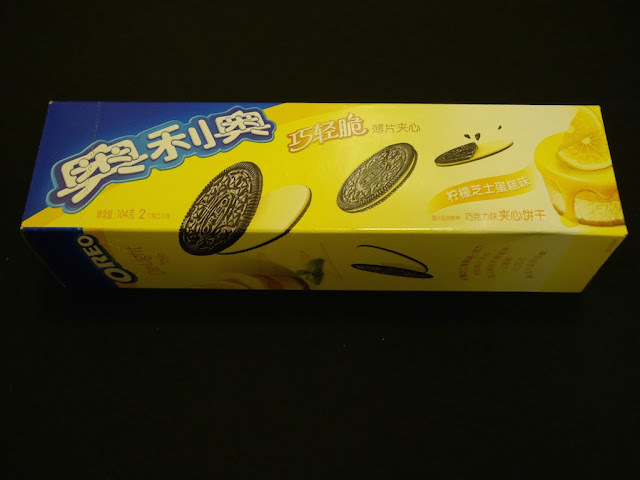 I am somewhat surprised I haven't seen similar examples more often in China. Baltimore was more eventful in this regards. I have no idea what the man did with the broom handle. It looks like it could have been a great skewer for some large pieces of beef. 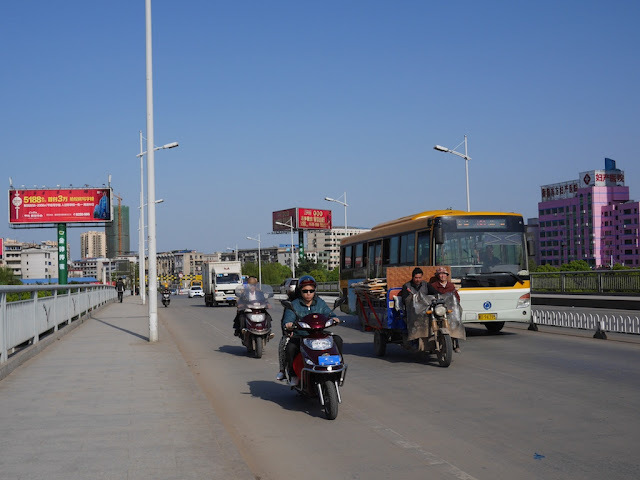 Recently I shared examples of people using mobile phones while in control of moving motorbikes in Hengyang. 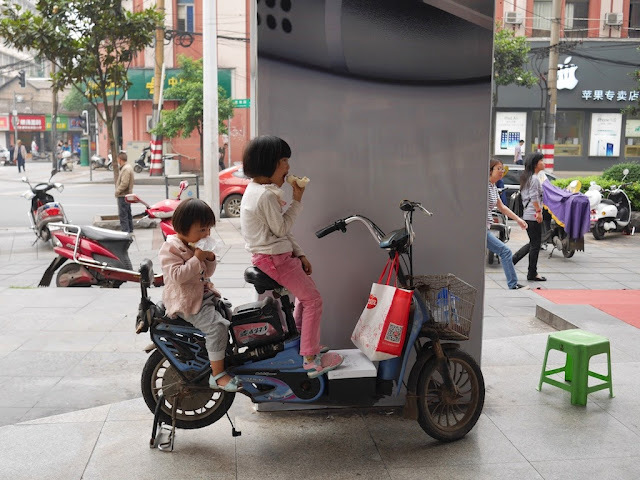 Today in Changsha, I saw an example of someone using a mobile phone while riding another type of powered vehicle. 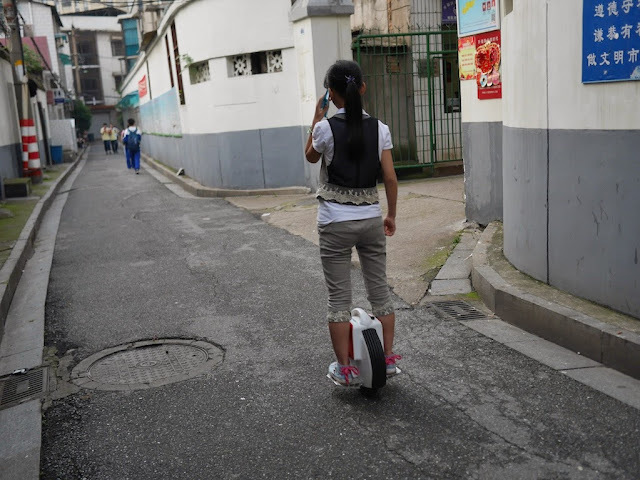 Despite the vehicle only having one wheel, I suspect the phone use presents less of a safety issue given the vehicle's slower speed and it not requiring any hands to operate. Although they are not an everyday sight, I have noticed more and more electric unicycles in use, often rented for a fun ride. I didn't ask the girl if she owned the unicycle. She appeared preoccupied as she zoomed past. 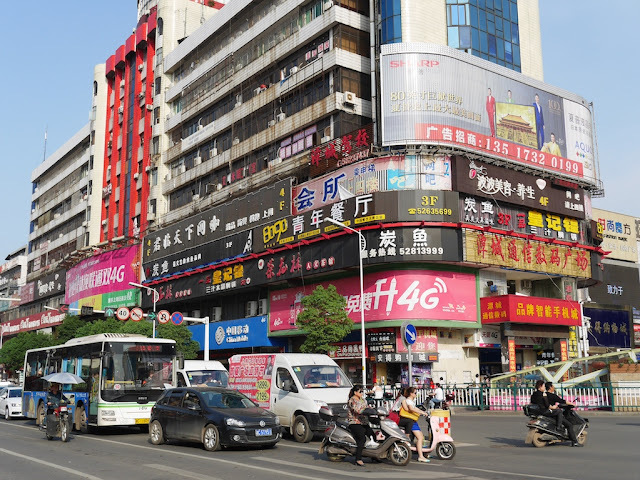 Over a month ago I arrived in Hengyang, Hunan. 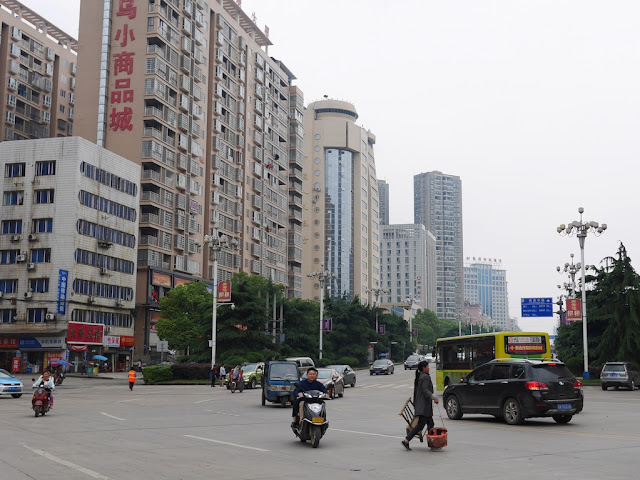 And almost exactly a month ago I left Hengyang and went to neighboring Shaoyang. From Shaoyang I went to neighboring Loudi. From Loudi I went to neighboring Xiangtan. 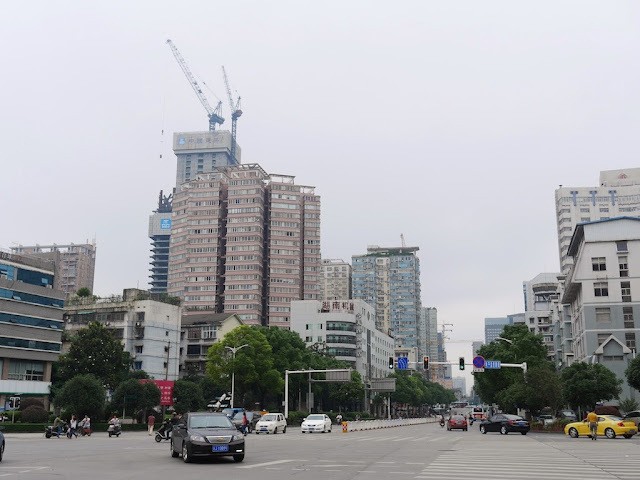 From Xiantan I went to neighboring Zhuzhou. 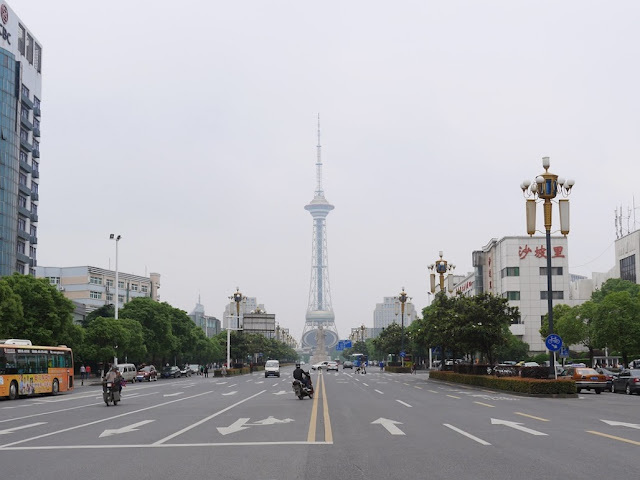 From Zhuzhou I went to neighboring Changsha — the capital of Hunan province and where I am now. Both Hengyang and Changsha were return visits. 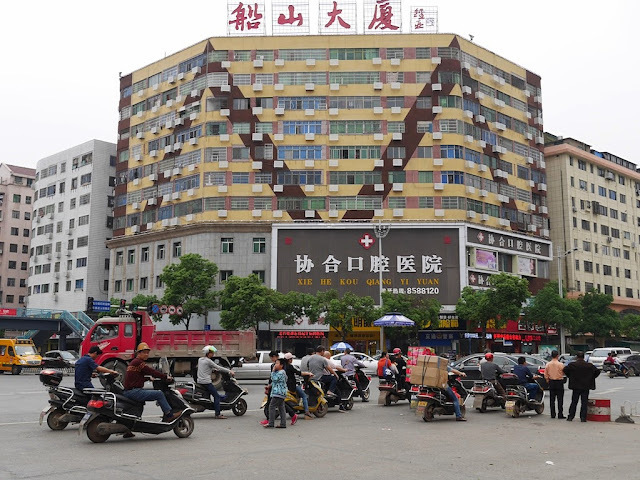 The other prefecture-level cities in Hunan were first-time visits, and by design, with one minor exception, I have not previously mentioned them here. After flipping through all of my photos from the past month to prepare this post, I am reminded I have more than enough to process and share. 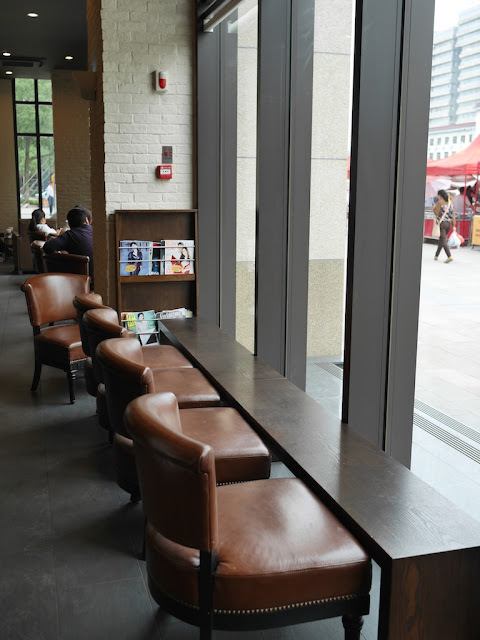 The frequent travel and amount of time I spent immersing myself a diverse set of cities meant I was not able to blog as much as I would have liked. 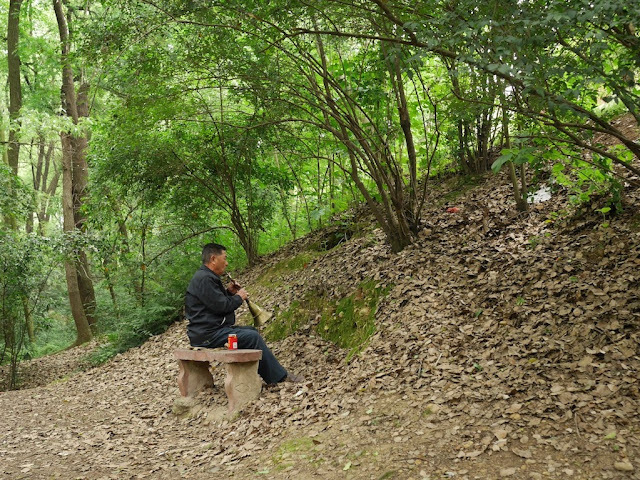 In the near future, I will share some of what I have experienced and learned in Hunan. 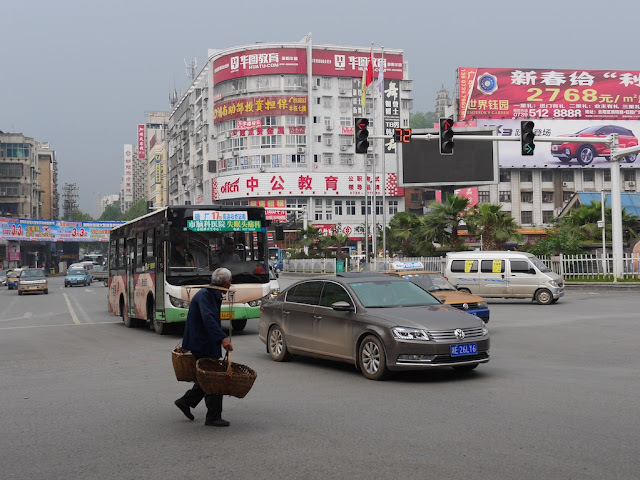 I plan to also touch on some topics related to two cities elsewhere in China where I spent a significant amount of time earlier this year — Chongqing and Zhongshan. So as usual, more soon . . . 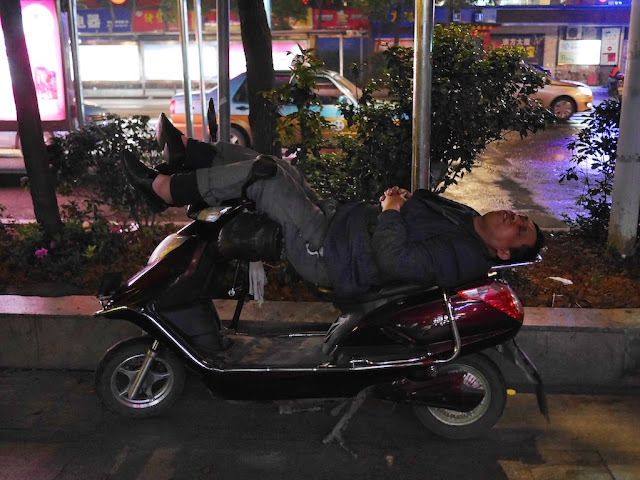 Whether or not you are a motorbike-taxi driver in Hengyang, sufficient sleep is an important part of a healthy work-life balance. Some people are more flexible in where they can get it. 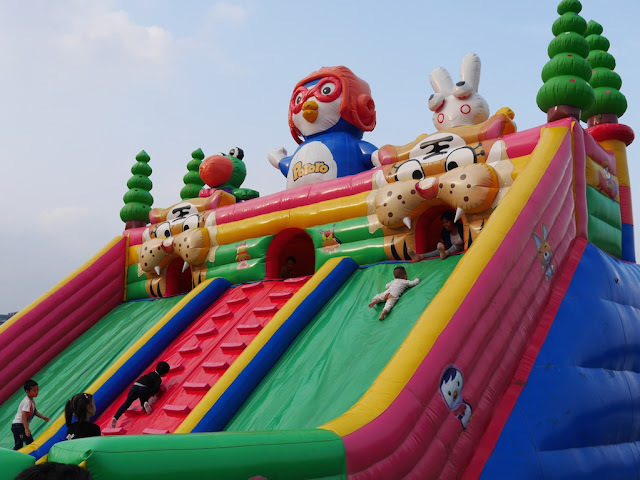 At Donghu Park in Zhuzhou, Hunan, during the day children enjoy playing on an appropriately inflated slide. At night children may reflect when they discover the slide has been deflated. Some may even prefer it that way. 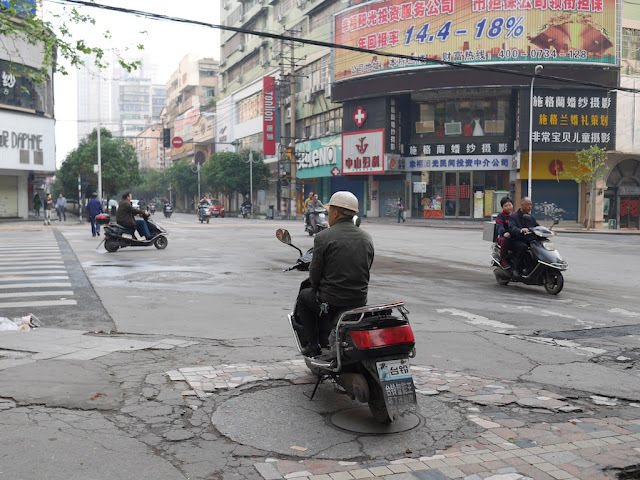 The two types of helmets seen in the photos are common equipment for motorbike-taxi drivers in Hengyang. 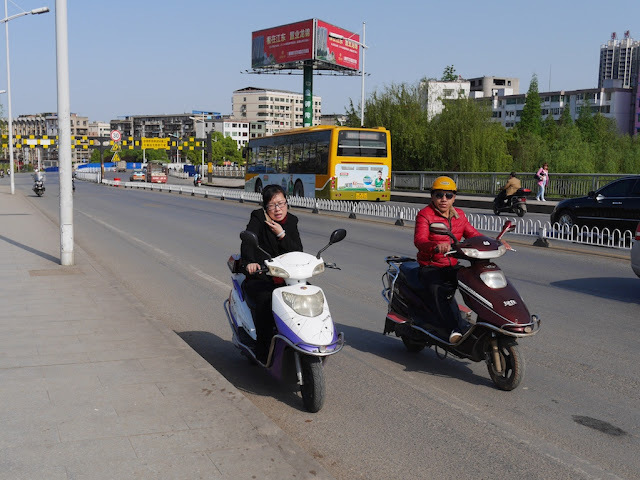 As suggested in an earlier set of photos of motorbike drivers in Hengyang, most other people ride sans helmet. 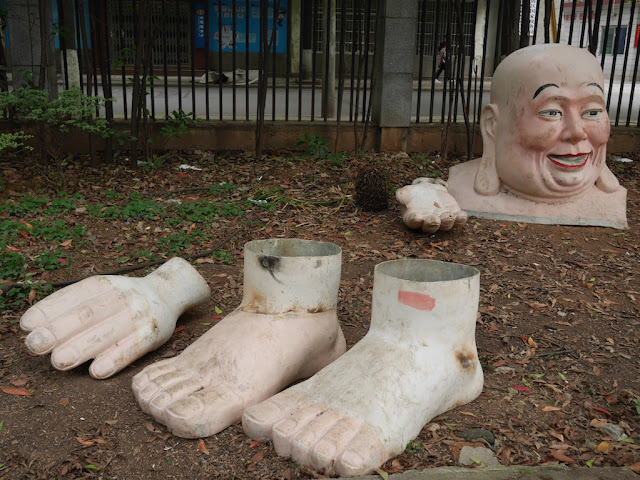 This Buddha appears to be ready to lend a hand . . .
. . . or a foot. 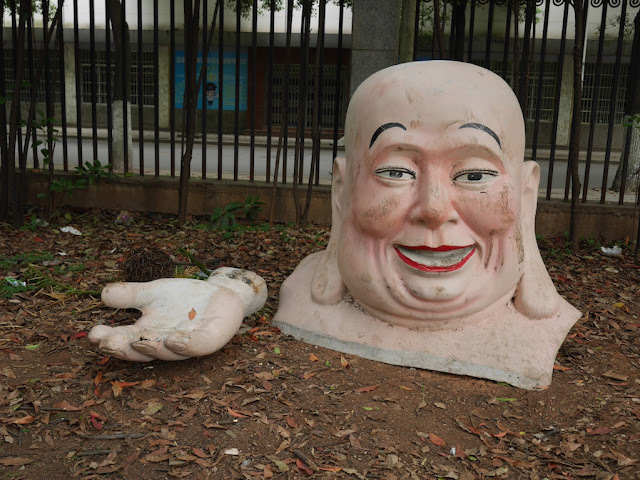 I don't know why the parts were there, nor do I know what became of the rest of Buddha's body, assuming it ever existed. Perhaps a deep message is intended. Perhaps one can be found. 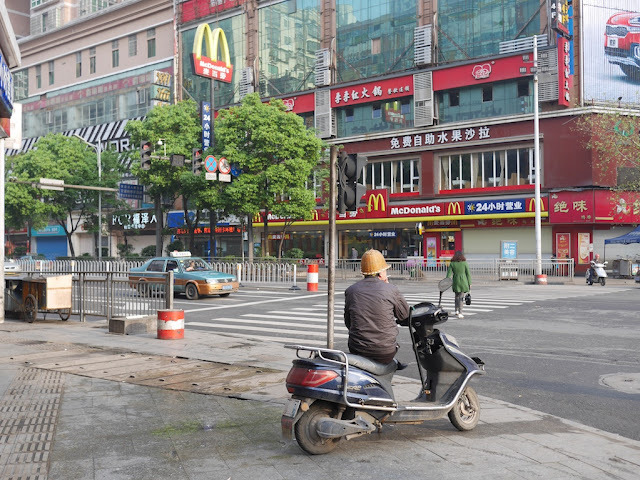 A recent study conducted by seven Chinese hospitals across five cities found that more than half of the Chinese population suffers from the same problem. The study measured vitamin levels in more than 2,000 volunteers and found that only about 5% of participants had healthy levels of Vitamin D, which is crucial for strong bones and a healthy immune system. That’s compared to about 67% of the U.S. population whose Vitamin D levels are deemed sufficient, according to a 2011 Centers for Disease Control and Prevention report. Most people meet at least some of their vitamin D needs through exposure to sunlight. Ultraviolet (UV) B radiation with a wavelength of 290–320 nanometers penetrates uncovered skin and converts cutaneous 7-dehydrocholesterol to previtamin D3, which in turn becomes vitamin D3. Season, time of day, length of day, cloud cover, smog, skin melanin content, and sunscreen are among the factors that affect UV radiation exposure and vitamin D synthesis. Perhaps surprisingly, geographic latitude does not consistently predict average serum 25(OH)D levels in a population. Ample opportunities exist to form vitamin D (and store it in the liver and fat) from exposure to sunlight during the spring, summer, and fall months even in the far north latitudes. Complete cloud cover reduces UV energy by 50%; shade (including that produced by severe pollution) reduces it by 60%. UVB radiation does not penetrate glass, so exposure to sunshine indoors through a window does not produce vitamin D. Sunscreens with a sun protection factor (SPF) of 8 or more appear to block vitamin D-producing UV rays. 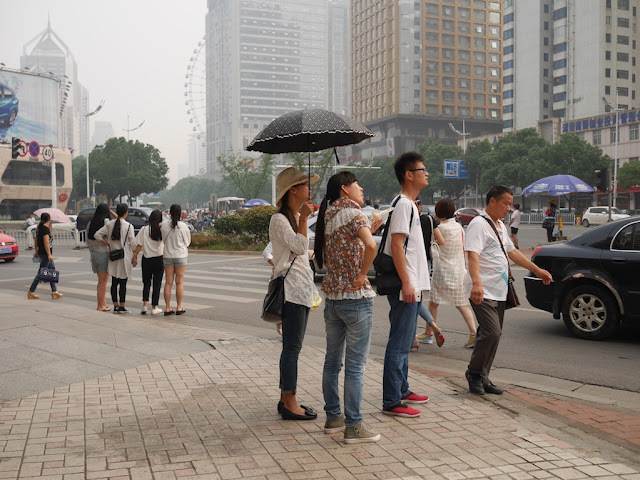 Unsurprisingly, the researchers in China suggest people spending less time outdoors and high levels of smog as causes for the large number of people with a vitamin D deficiency. But a possible contributing factor not discussed in the journal article exists as well. I moved to the side just in time. She was not hiding from my camera as she walked down the sidewalk. Instead, most likely she was trying to avoid the bright sun that day. I saw multiple similar examples, all involving females, just minutes apart on the same bridge. 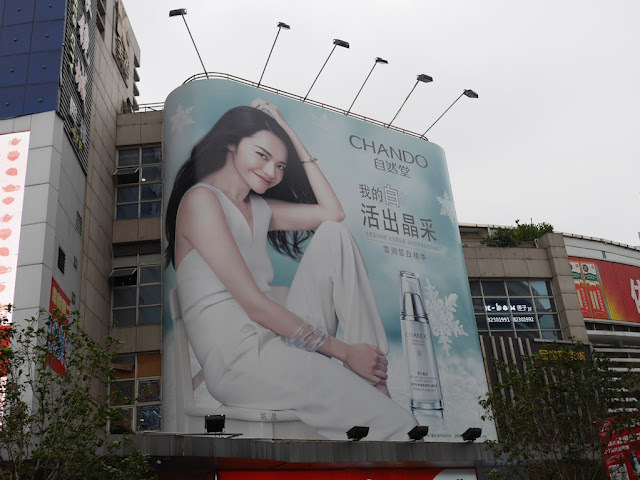 None of this surprised me in the least, since many women in China desire whiter skin or, at the very least, don't want their skin to become darker. 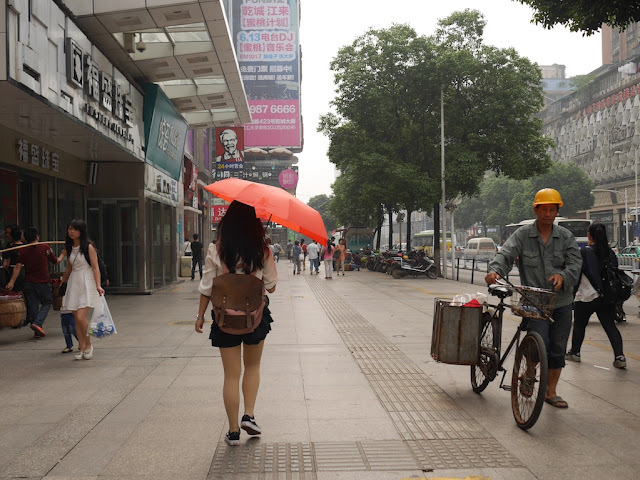 In addition to skin whitening cream for sale, a big business, in many parts of China it is common to see younger women using umbrellas outside on sunny days. When an umbrella isn't available, a variety of items, such as bags, extra clothing, and paper flyers, may instead be used as shields from the sun. So even if they are outside on a sunny day, they are missing out on a prime opportunity for vitamin D.
This type of behavior probably doesn't account for all of the researchers' findings, such as the significantly lower vitamin D levels for males in Beijing aged 49 to 59 years. 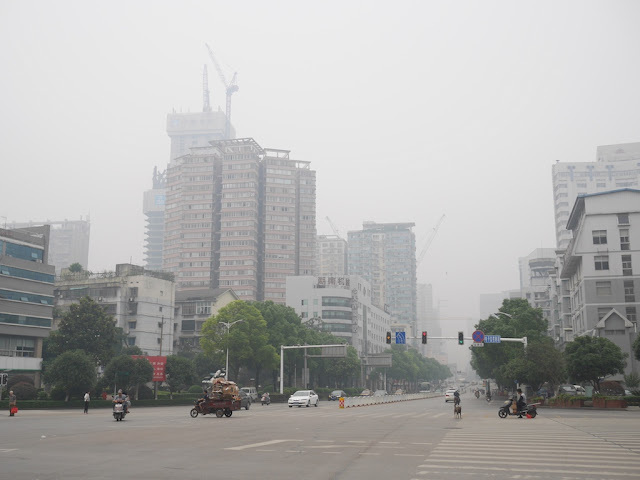 Again, other factors such as time spent indoors and levels of smog likely play a role. Yet the well-established connection between UVB exposure and vitamin D levels, the prevalence of people actively blocking the sun's rays while outside, and the study's finding that vitamin D levels were overall "much worse among women and younger participants" make it more than fair to suspect the desire for whiter skin has contributed to China's vitamin D problem. In the near future, I doubt many people who now prefer lighter skin would rethink their views and seek more outdoor UVB exposure, even if the air quality and their schedules allow it. Instead, as Abkowitz suggests, increased demand for vitamin D supplements and fatty fish, one of the better natural food sources for vitamin D, is far more likely. I can't imagine how much their prices would go up if they were found to also cause lighter-colored skin. 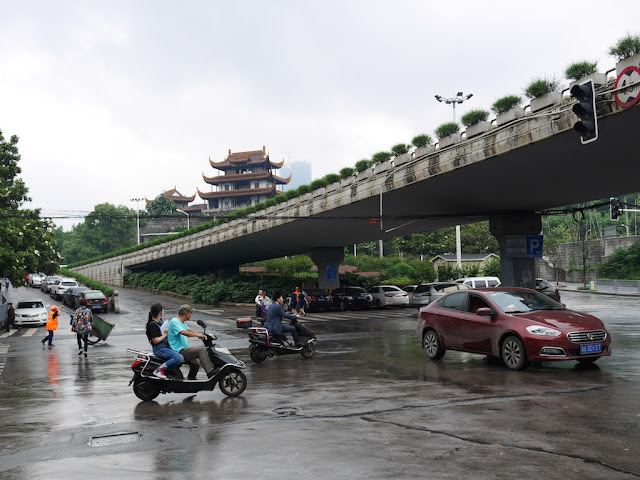 The Hengxiang Bridge offers an excellent opportunity to appreciate Hengyang's "traffic culture" and the variety of vehicles used there. In all four cases, a person was using their mobile phone while driving a motorbike. The above capture most, but not all, of the examples I saw. Later as I walked back across the bridge, I saw one man park his bike in the dedicated bike lane and then have a phone conversation as he stood on the sidewalk. And finally, tying it all together in what felt like a brief magical moment, I saw a man using a mobile phone while he rode by and looked at a woman who had stopped to use a mobile phone. It is a just a small period of time and only a single location. 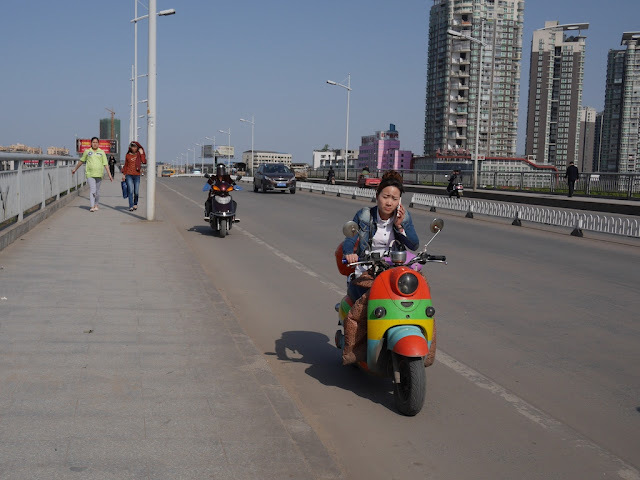 But if representative, it suggests a large number of people in Hengyang are willing to use their phones while driving a motorbike, at least under some conditions. 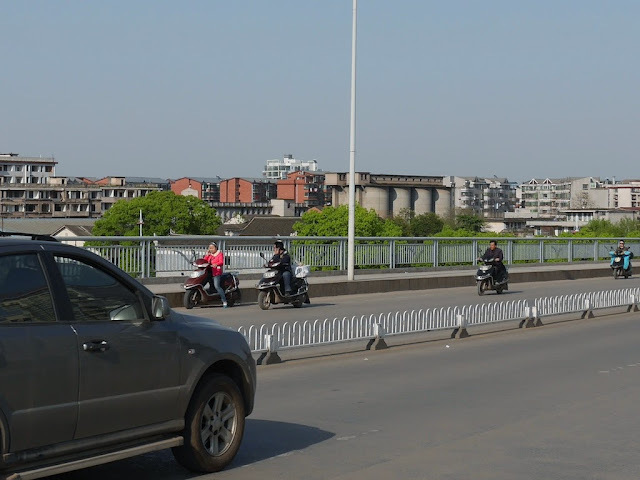 And much else could be learned, better appreciated, or questioned at this single bridge in Hengyang. The view may not seem special, but that doesn't have to be the point.